This short from Georges Méliès involves giant insects and magical transformations, two frequently-recurring themes in his work. I include it in my “history of horror,” in part because of an ending that seems to suggest that a man has lost his humanity. A bearded man in a turban walks onto a set decorated to appear as a tropical forest or jungle. He brings out a large barrel-shaped object and attaches it to wires, then produces a flute and begins to play. 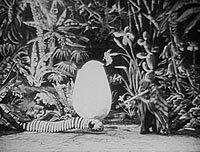 An enormous worm-like creature (no doubt a caterpillar, but without any visible legs) craws onto the stage in answer to his summons. He kisses it affectionately, then puts it into the hanging object, which we now perceive is a giant cocoon. After a moment, the lid comes off and a woman with antennae and butterfly wings is pulled out on wires, appearing to fly. She stands on his hand for a moment, then flutters to the ground. The man pursues her as she dances about, and throws a blanket over her head, causing her to stop moving. Two other women now approach and remove the blanket, revealing that the butterfly has now transformed fully into a woman. The man falls on his knees before her, but she spurns him, finally putting her foot on his neck. This causes him to turn into a caterpillar, and he crawls after her when she departs with the women. The appearance of the gigantic worm already had me thinking about including this movie in the run for October, but it was when the “Brahmin” was turned into a worm himself that I was really sold. The worm is cute, really, not frightening, but the idea of a human becoming one is creepy nonetheless. In this case, it seems as though the Brahmin has lost himself due to his powerful attraction to the butterfly-woman, and goes from being a powerful magician to a crawling worm for love. This movie was apparently based on a stage act by a fellow magician, Buatier de Kolta, which may have appeared on the stage at the Robert-Houdin Theater before Méliès filmed it and screened it there. A “Brahmin” is a Hindu priest, but I would imagine that Méliès was using the term for added exoticism, not out of a genuine interest in reincarnation. Still, one could argue that this Brahmin falls back into the wheel of Karma and misses out on enlightenment because of his attachment to the butterfly and inability to rise above human passions.